The 7th Ling Trul Dorjee Chhang Tenzin Lungtok Rinpoche on Sunday reached Tawang for a weeklong visit to the district. 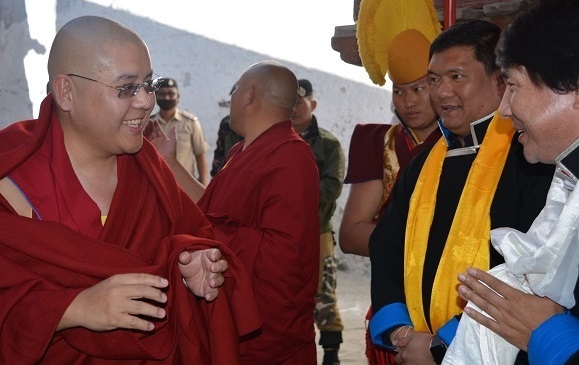 The Rinpoche was received at the Tawang Monastery by Arunachal Pradesh Chief Minister Pema Khandu, MLAs Jambey Tashi and Tsering Tashi, DOKAA (Chosrig affairs) chairman Jambey Wangdi, deputy commissioner Sang Phuntsok, SP S S Kalsi and host of other public leaders, monks, nuns and devotees. This is second visit of the Rinpoche to Tawang after nearly twelve years. The Rinpoche during his stay here will give teachings and initiation on ‘Avalokiteshvara’, the lord of compassion on Wednesday which will be followed by initiation of Vajrapani (protector and guide of Gautama Buddha) and Manjushree on Thursday. A long life initiation is scheduled for Friday. Besides this, the Rinpoche would also visit Bramdungchung nunnery and some other monasteries in the district. Ling Rinpoche is a Geshi degree holder from Drepung Loseling Monastery of South India and is believed to be in his previous life the teacher of the 14th Dalai Lama and previous Dalai Lamas.